Electricity transmits more efficiently at higher voltages and it’s the standard used worldwide. 120 or 240 volt in the USA at 60 cycles per second. Inverters are available in a wide range of wattage capabilities. 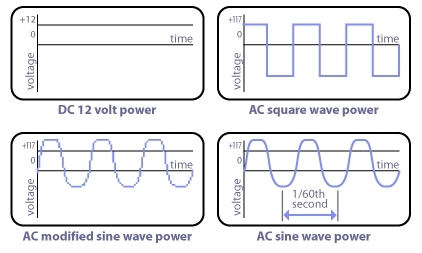 Now, modern inverters produce a modified sine wave which takes care of most of the problems that square-wave inverters had. Modified sine wave is not quite the same as power company electricity. They are lower cost, very efficient and most appliances will accept it although there are some notable exceptions. Check the additional information link on the right for inverter problems and troubleshooting. Modified sine wave inverters are a good choice for smaller sized PV systems. 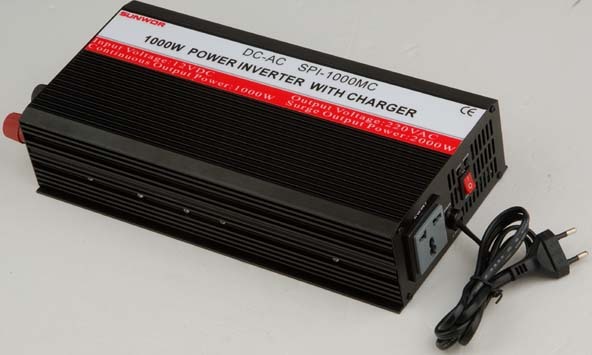 True sine-wave inverters deliver top quality AC power (better quality than the power company). Because they work well with any appliance, they are becoming the standard for larger household power systems.